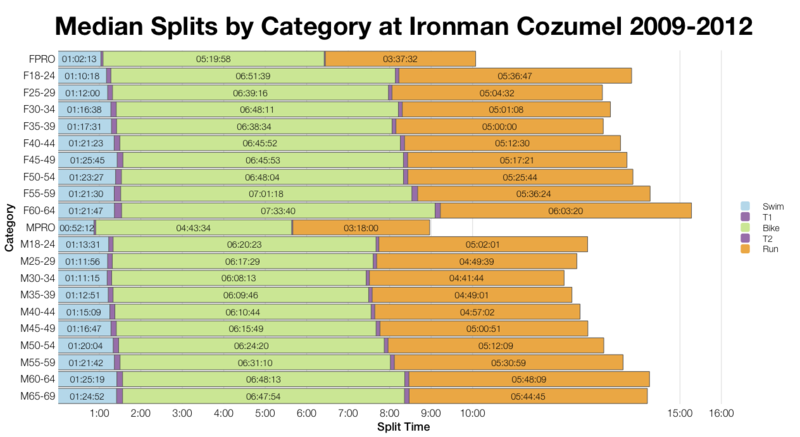 In last week’s pre-race analysis I noted that while Ironman Cozumel appeared to be very slightly faster than the average North American race it also had the capacity to be slower under the right (or wrong, depending on your perspective) conditions. 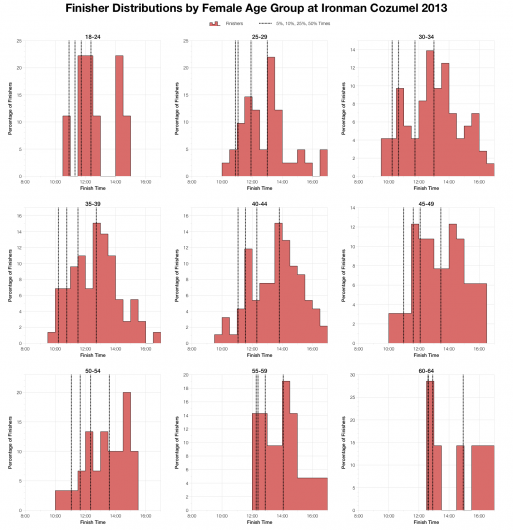 A good example of the challenge of attempting to guess performance requirements on the basis of historic results. Sure enough where last year’s race was most notable for a slower than normal swim, this year’s event produced much quicker times on a shortened course. 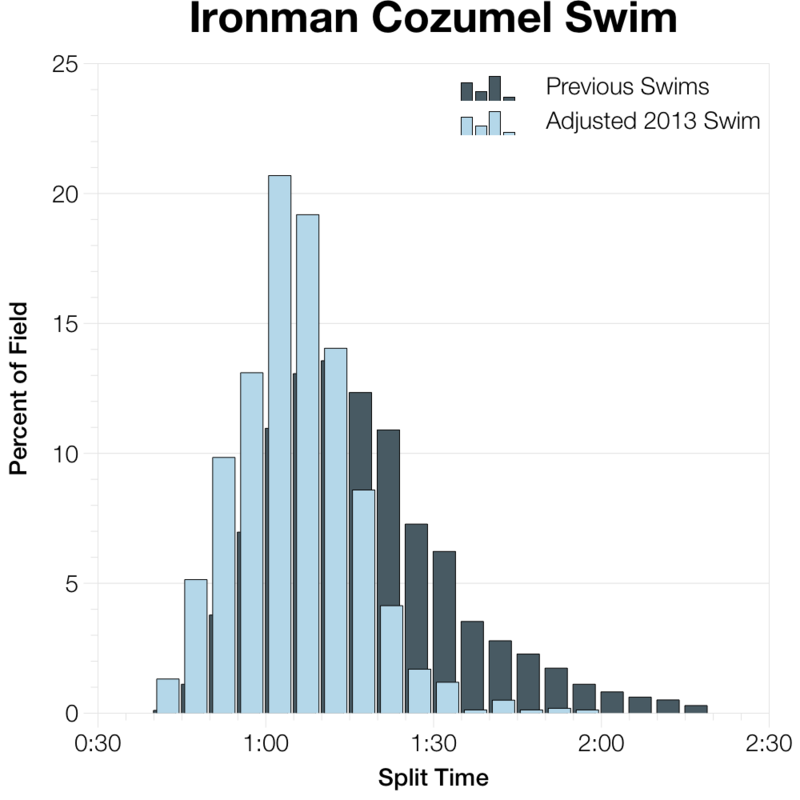 Wind conditions resulted in the swim being reduced to 3.1km resulting in fast swim splits and a faster year in Cozumel. 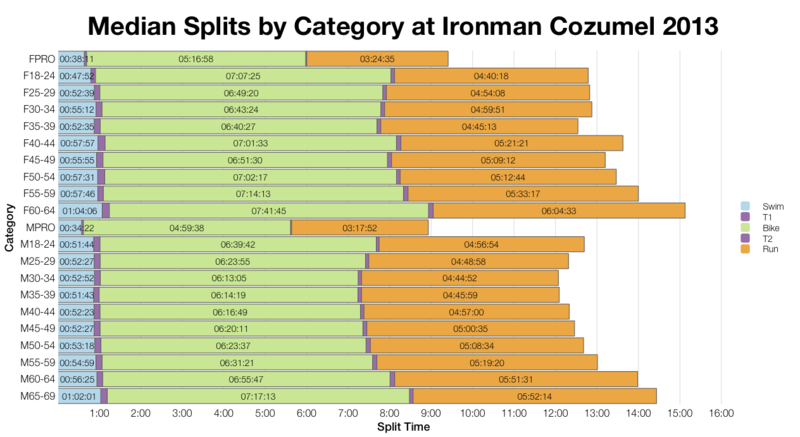 Comparing the split distribution among finishers from 2013 with previous years (above) it’s clear that the swim is the major difference. 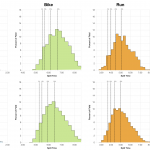 Bike and run are broadly similar, particularly when using the dotted percentile markers to compare, and the faster overall times in 2013 are a natural consequence of quicker swims. 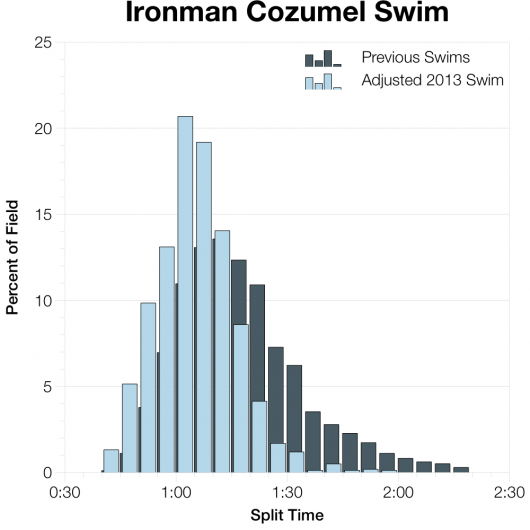 The impact of the shorter swim course, and presumably conditions on the day, is significant with well over 50% of the field finishing in under an hour. Knowing the swim was 3.1km long I can attempt to scale swim times to reflect on how they might have looked over a full length course. The graph above shows that simply scaling the times still results in a much faster distribution than previously seen. Assuming the 3.1km is accurate conditions were likely also favourable. The impact of a course change is much more complicated than a simple linear transformation. 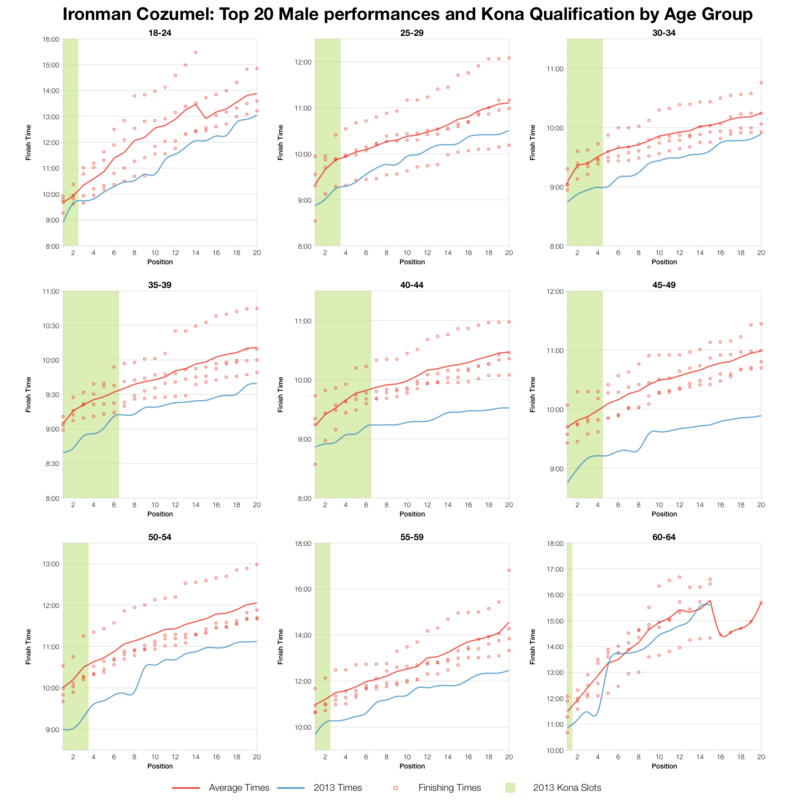 For those interested in their own age groups and how the results shaped there the two graphs above offer a little more insight and indicate times for the top 5, 10, 25 and 50 percent of the field. 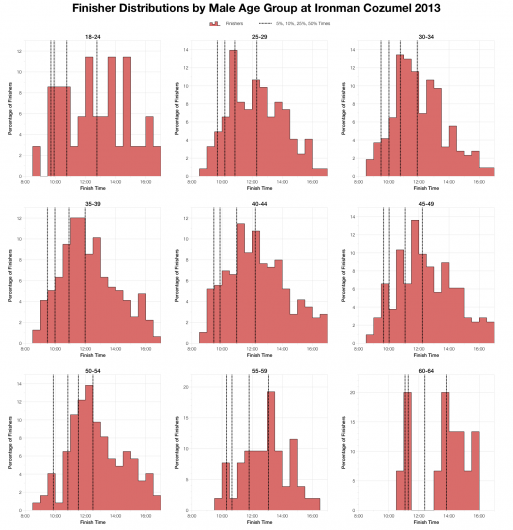 We expect the median splits to follow the same pattern as the distributions. 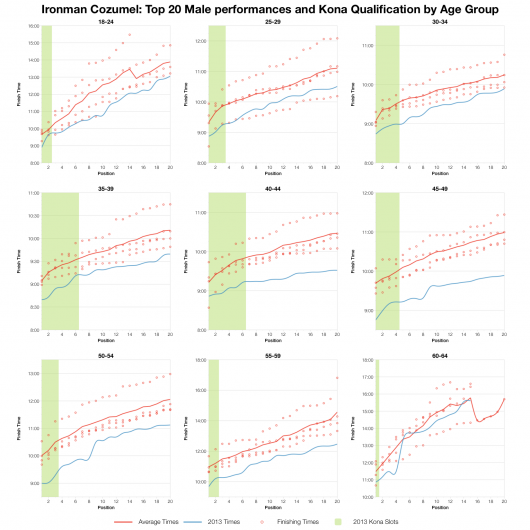 Skipping over the swim, both bike and run times are generally comparable, with bike times being a touch faster among the male age groups in 2013. 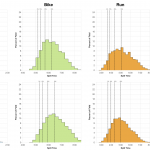 The pattern is less clear among the female field with bike times often slower and run times mainly faster. 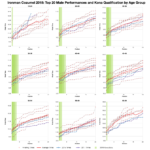 It goes without saying that the top 20 age group performers are generally – but not universally – faster than in previous years. 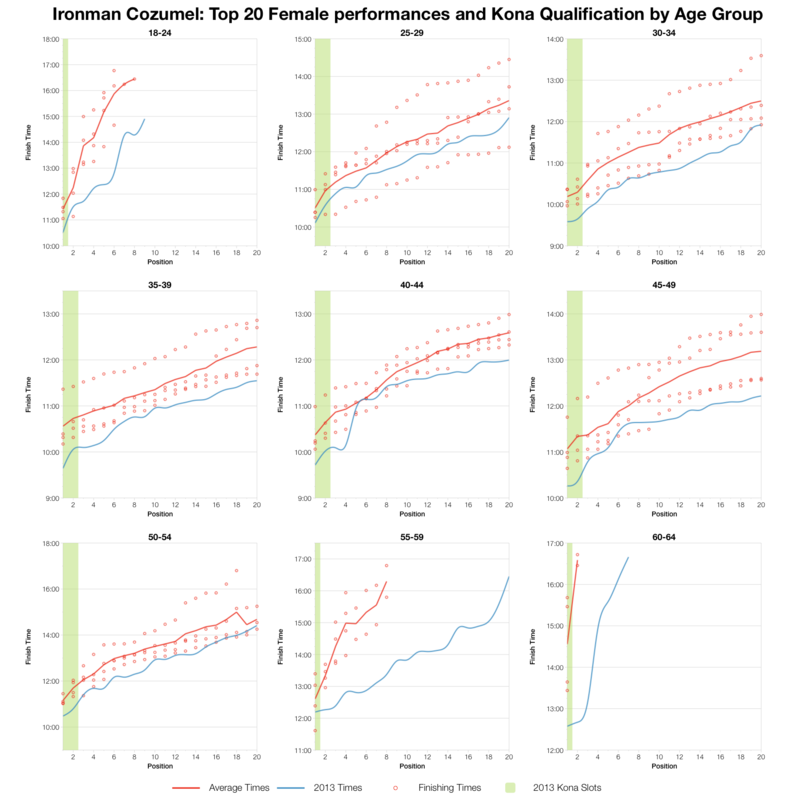 Qualification times this year are well ahead of the average. Slot allocations are based on my estimates prior to the race and did vary on the day based on lower starter numbers. I’m told that a number of slots also rolled with both the M70-74 and M75-79 slots moving to the largest age category, M35-39, taking their total up to 8. It’s not often you see that much gain, but it’s the reason you should always go to the roll down. So Cozumel hammers home the point that whatever has happened before it’s what happens on the day and how you perform under those conditions that counts. 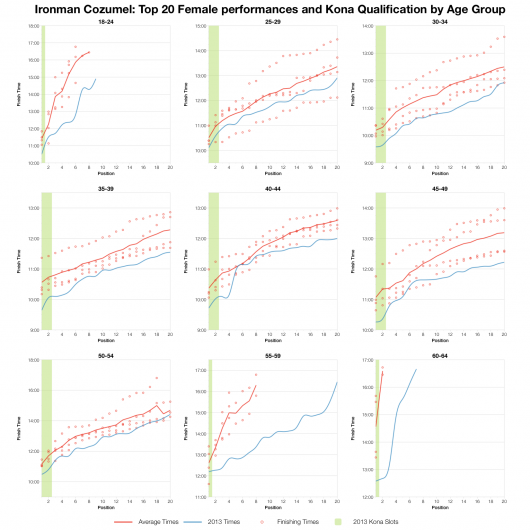 This year’s race was faster, but this can be attributed to the shortened swim, had that not been the case we might expect results a little closer to the norm. I’ve uploaded a spreadsheet of the full results and splits from Ironman Cozumel 2013 to Google Drive.